I have a longstanding policy of whenever I’m going somewhere far from home on business, I try to squeeze in a touristy trip before or after the meeting. This dates back to when I was a trade press journalist for an international magazine based in London, and often had to go to European cities to report on trade shows and press conferences. I wish the FitBit had been invented in those days, as it would have been rewarding to see how many paces I’d notched up pounding those city streets when my work was done. Since I’ve lived in the Cotswolds for nearly 25 years now, visiting London, even though I was born there, counts as far from home. Whenever I go to London for a meeting, if possible I plan my train times to allow spare time to be a tourist before or after the business chunk of my day. Thus I found myself one day last month striding through torrential rain from Faringdon tube station to Fleet Street, before I was due to join Orna Ross at the Free Word Centre for a meeting with two lovely people from two publishing trade organisations. Destination: the legendary St Bride’s Church, which on its website is dubbed “spiritual home to the media”. When I was a teenager, I thought my career might lie in Fleet Street, which when I was growing up was still home all to the national newspapers and many more print media. I assumed it would only be a matter of time before I was passing St Bride’s every working day. Before long, virtually all the press and print trade had moved east, to the regenerated London Docklands. During my stint as a trade press reporter in my twenties, I was based in Belgravia. So my close acquaintance with the church remained a teenage daydream. The name St Bride’s also had other associations from my formative years, as the girls’ secondary school I attended aged 11-14 (alma mater also to my mother, sister and aunts), was divided into four houses for competitive purposes: St Anne, St Bride, St Francis and St Mary. It wasn’t a Catholic school, and they never actually taught us anything about our saints, but the impact of the houses on our daily lives was such that my old schoolfriends and I still remember which one we belonged to and which colour they were. I was in St Bride’s, which was yellow. 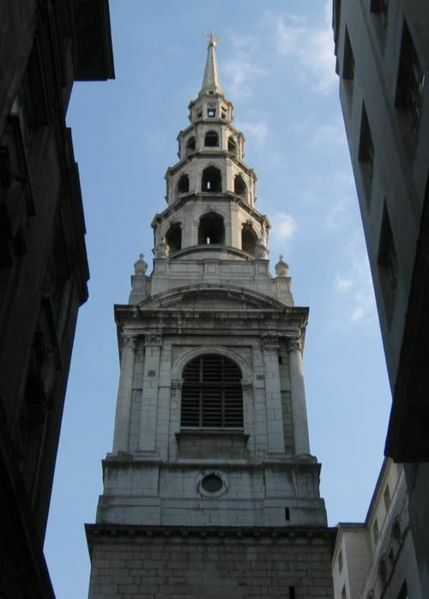 Just off Fleet Street, the shady, welcoming and peaceful church of St Bride’s still retains its ethos as “the journalists’ church”, despite the departure 30 years ago of virtually all the press and print businesses – “London’s last remaining manufacturing industry”, as the informative exhibition in the church crypt advised. This part of London has been the historic home of the print trade ever since Caxton bequeathed his first moveable printing press to his aptly named assistant, Wyken de Worde (now there’s a nice piece of nominative determinism for you). St Bride’s Church prides itself on having been a source of comfort to the local print trade from its early days, through subsequent generations, including Samuel Richardson and Dr Johnson, to the birth of the first news sheets to the thriving newspaper trade of the nineteenth and twentieth centuries, whose boom in sales was made possible by the coming of the railways to disseminate them to the masses around the country. Nearby are many other sources of succour, i.e. atmospheric Dickensian pubs straight out of an illustration by Phiz. Not surprisingly, the church, for its own part, takes its role seriously as comforter, offering daily services before work and at lunchtimes, plus regular special events. It’s easy to be cynical about journalists’ preference for comfort, especially when at the time they left Fleet Street in the 1980s, the culture remained that it was acceptable to drink alcohol at lunchtime. I had friends who worked in City branches of Barclays Bank who regularly drank two or three pints of beer during their lunch break. At the press conferences I was attending at this time, you were thought a wimp if you didn’t accept at least one glass of wine, no matter what time of day it was. A few years later, when working in PR, I had a client who would bring out the sherry for a 10am meeting. He once drove me to the local station to catch my train when I knew him to be well over the limit. Yet he was MD of a very successful company. How times have changed – and just as well! Spend a few minutes inside St Bride’s Church, and you’ll gain a different and more touching picture of the nation’s press. Soberingly (groan), in one corner stands a table crammed with photos of departed journalists, including those missing in action, victims of terrorist kidnap, and of murder. Beside these is a transcript of the Journalist’s Prayer, in which the supplicant asks God to help him use his powers for good. I’m not religious, but, I was very moved, and I lit a candle for solidarity. Without a flicker of irony, lining the walls and pews are sponsored plaques commemorating great journals and their journalists. Also, curiously, one from British American Tobacco, which made me look out for others from Gordon’s Gin and kindred spirits, without success. The plaques for the serious broadsheets dominate the north wall, while the south sports the frivolous popular press, their brazen redtop logos undimmed by the serious setting. This gave St Bride’s the appearance of being the Parliament of Fleet Street; I pictured The Times and OK magazine hurling abuse at each other across the floor of the House. A small gift shop at the back of the church offered low-priced branded souvenirs. I came away with some bookmarks, a pencil to inspire my next journalist piece, and a gratifying sense of having communed shaken hands with the history of the media. If you can visit it in person, even better.